The large main saloon features sophisticated styling, with comfortable sofas and coffee tables, leading into the sectioned off formal dining space where guests can enjoy sumptuous meals prepared by Eleni’s talented chef. The sky lounge is the second largest guest space, styled for relaxation and ideal for gathering to enjoy the spectacular views or pre-dinner canapés and cocktails. Eleni is defined by her extensive outdoor spaces, that make her the perfect choice for charter groups looking to make the most of their surroundings, with plenty of options for sunbathing, relaxing, al fresco dining and more. 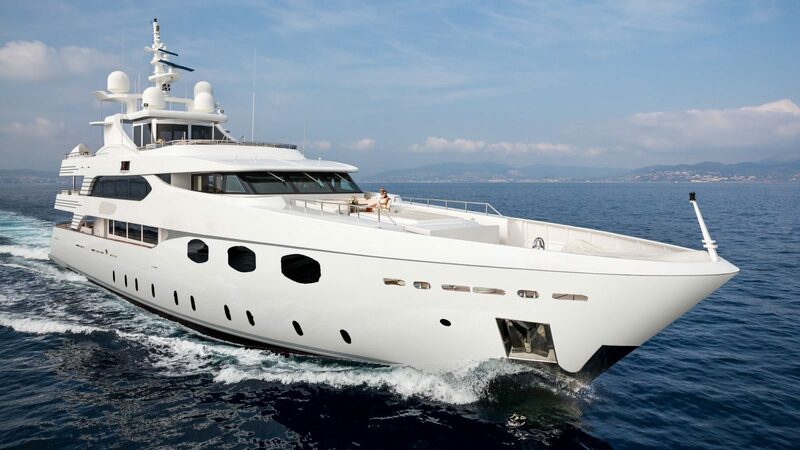 The main deck features covered seating, while the huge sundeck is home to numerous features including sunpads, a bar and Jacuzzi forward and a climate controlled glass-walled gym amidships. The aft sundeck is home to plenty of sun pads, modular sofas and love seats aft. The upper deck – which connects directly with the sky lounge – is a popular spot for enjoying al fresco feasts.